HERE'S A WAY cool idea that has quickly taken off and will be a lot of fun Saturday. 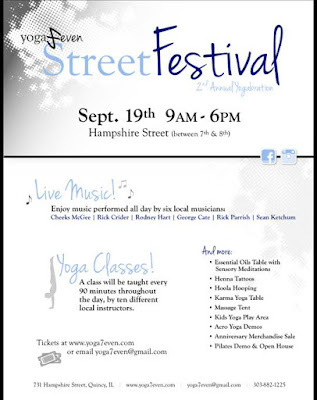 It's the second annual Yoga and Street Music Festival, brought to you by the good folks at Yoga7even. 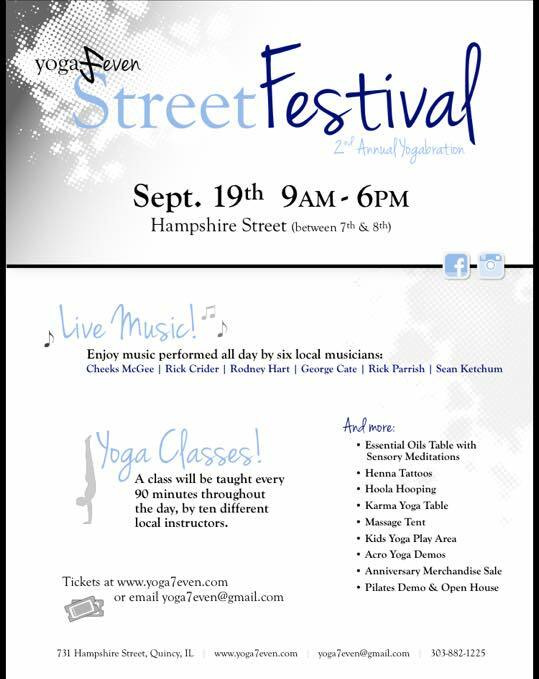 The stage is set up right in front of the Yoga7even studios near Eighth and Hampshire, and there are Yoga classes every 90 minutes. Quincy needs more unique events like this. Cheeks McGee put the musical lineup together and I'm honored he asked me to play. I'm up at noon and hopefully followed by George Cate - no way am I playing after that guy, he's way too good! It's a solo gig sandwiched between HartLyss at Cellar 21 Friday night and The Cheeseburgers at Pop's Club in Hannibal Saturday night. We'll sleep when we're dead. Or after Yoga class.